It is not often that would we wholeheartedly celebrate and promote a place of accommodation for which, as travel professionals, we receive no earnings on bookings. 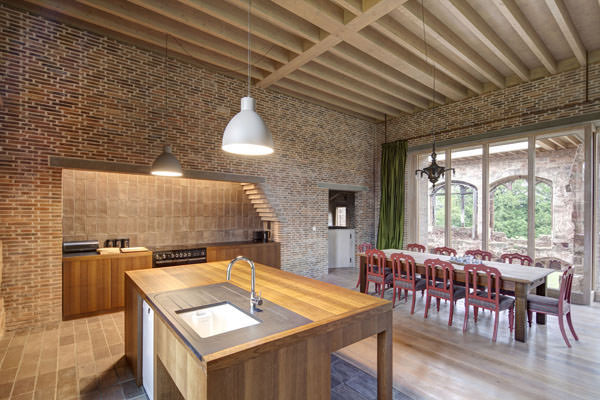 Once in awhile a design project – make that a transformation – is so unusual and irresistible that we give ourselves permission to show it off as a story on Architectural Holidays. 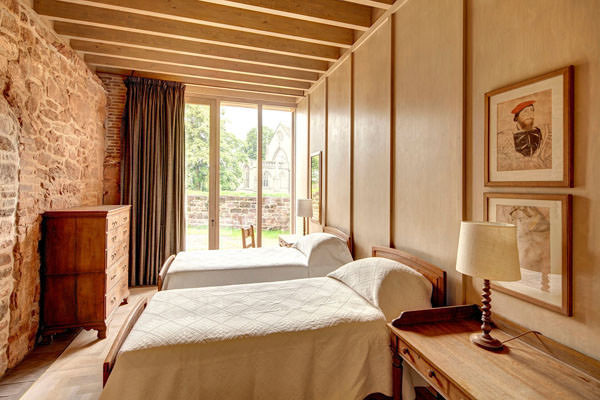 We are talking about Astley Castle, a former medieval manor that had a storied life,and is now having a rather spectacular second life as a holiday rental offered by the Landmark Trust. 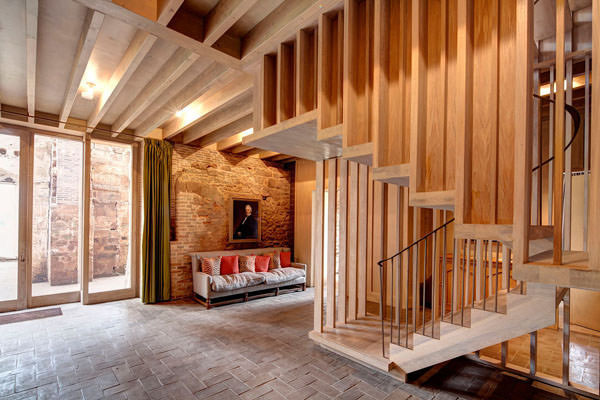 No one could have predicted that this special place would go on to earn the design team who transformed it, Witherford Watson Mann, the highest honor bestowed for architecture in the UK – the 2013 RIBA (Royal Institute of British Architects) Stirling Prize. RIBA’s Stirling Prize is similar to the Pritzker Prize awarded by the AIA (American Institute of Architects). Astley Castle, as with most historic buildings in the UK, is near and dear to our hearts. We started Architectural Holidays back in 1994 as a honeymoon planning company, specializing in British castles. We still do. We visited Astley Castle as a simple but lovely ruin in Warwickshire many years ago, and thought it well worth the visit. Ruinous stone buildings are quite dramatic, as there is no evidence of modern intervention, constructively or otherwise. Well now that all has changed, complements of the Landmark Trust. 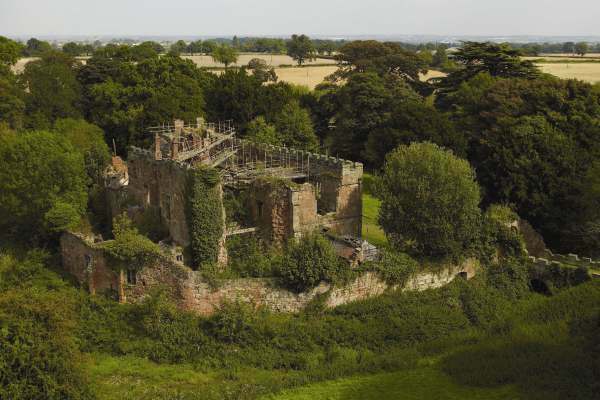 Astley Castle dates to the 12th century– it’s hard to imagine it is almost 1,000 years old! While it was built more as a fortified residence than a castle, this is not to say there was no historical drama along the way.Three Queens lived at Astley during the 15th and 16th centuries, a time when seemingly everyone wanted the throne of England and many gave their lives seeking it, defending it, or sadly being caught in between. The castle was in the Astley family until the early 15th century when it passed to the Grey family. By marriage to Sir John Grey, England’s first Yorkist Queen, Elizabeth of Woodville, is believed to have lived at Astley, Grey died in battle, defending the Lancastrians, and Elizabeth married Edward IV, the opposing Yorkist King. Another future queen to have passed through Astley’s doors was their daughter, Elizabeth of York, who married Edward VII, the first Tudor King and father of Henry VIII. It is this same Grey family who later attempted a claim to the throne for Lady Jane Grey, great-granddaughter of Elizabeth of York. That ill fated interlude as Queen of England lasted 9 days and cost Lady Jane Grey her head. Mary, first child of Henry VIII took her rightful place as Queen Mary I. Most of the castle’s defining appearance was to the credit of the Greys. They added a second floor which can be seen today. The family (what was left of it) occupied Astley until almost the end of the 16th century, when they were kicked out in disgrace following the Jane Grey debacle. Improvements were made by successive owners, with a brief period of occupation by Parliamentary Forces in the English Civil War. After WWII, the castle served as a hotel in the 1950s and was destroyed in 1978 by a mysterious fire. It remained essentially a declining ruin since then, operated by the English Heritage, and was listed as an endangered property. Then along came the Landmark Trust and the rest is history, to be told. Astley Castle as we see it today, clearly makes the point for keeping history alive while at the same time finding a place in the 21st century. 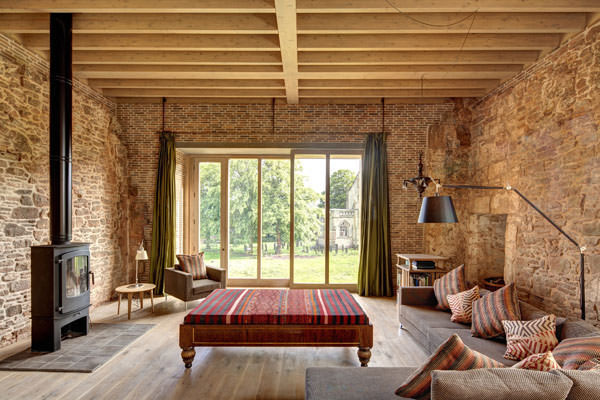 Though we have no authority to issue awards, we are sincere when we wholly commend Witherford Watson Mann Architects (WWM) for their unique interpretation and reconstruction of Astley Castle. The buildings that encompass the original Astley Castle site include the original moated castle / manor house, and portions of surrounding stone curtain walls and a nearby church. 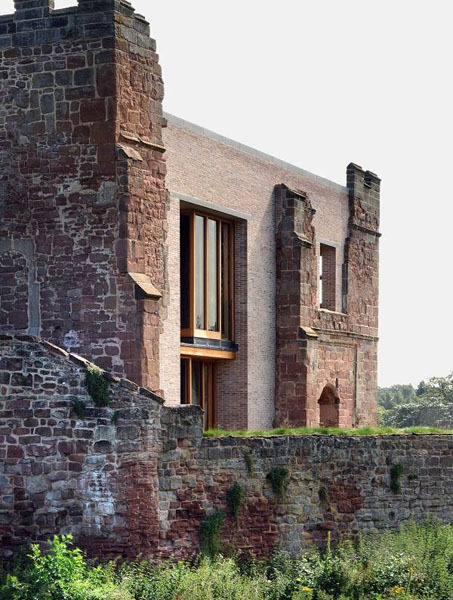 In order to maintain Astley’s historic fabric yet meet the objectives for converting this ancient beauty to a self-catered accommodation, some serious “thinking outside the box” was needed. Architects WWM, on the other hand, chose to think inside the box in creating their design solution. New walls and windows fill voids between missing sections of the older masonry walls. Where that was not possible or desirable, newly constructed walls, typically of glass, were created inside of the existing walls. This of course allows for history to remain and be fully experienced from within the accommodation. Since only the stone portions of the castle remain, new ceilings, floors and interior walls were constructed, in modern day wood framing. Repairs and restoration of the masonry walls were carried out in accordance with rules governing “listed” buildings, while complying with present day building codes. 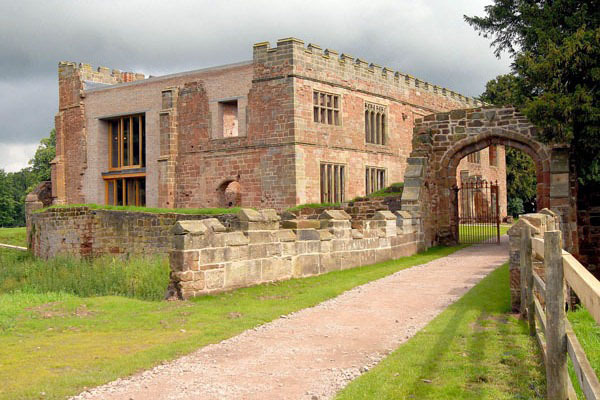 Astley Castle accommodates up to 8 persons, making it great for multi-generational groups or other special celebration. The Ground Floor contains the bedrooms (2 twin bedded, 2 doubles) and bathrooms, and the living areas, kitchen etc, are on the upper floor (referred to as the First Floor in the UK). There is a residential elevator for wheelchair access. Here are a few images of Astley Castle for future generations to enjoy, whether royals or not. Note: Now that we have hopefully sold you on booking a stay at Astley Castle, the bad news is that there is quite a long wait to secure a reservation. The Landmark Trust’s website indicates the castle to be fully booked through April of 2015. We have to believe there will be cancellations along the way, so be sure to check back often or contact the Trust directly. As of the date of this post, the published rate for a 4-night stay is 769 Pounds Sterling. The Landmark Trust will next year celebrate 50 years of rescuing early buildings in need of serious TLC, and then inviting the world to enjoy them as a self-catered holiday accommodation. The Trust was founded by Sir John Smith and his wife Lady Christian, who generally sought and took on the smaller historic buildings that for whatever reasons, were not of interest or financially viable to anyone else. Today there are almost 200 properties and we have to say, they are all special. If you’ve not spent time on their website (www.landmarktrust.org.uk) or thumbed through their catalogue, we encourage you to do so. There is one great building after another, certainly something for everyone and for all group sizes. Some of the properties are the works of rather accomplished architects, such as British architect Sir Edward Lutyens, for Goddards,and Renaissance architect Andrea Palladio, for Villa Saraceno, about an hour’s distance from Venice, Italy. Given that Astley Castle is fully booked through next year, get to know the Landmark Trust with a holiday in one of their other remarkable places in history.